The staff working on our emergency ambulances are either paramedics or emergency medical technicians. They respond to a wide variety of calls but mainly to serious or life-threatening calls. Emergency medical technicians and paramedics are trained to deal with life-threatening illnesses and injuries. However, paramedics are trained to carry out invasive procedures which they may need to perform during the most serious medical emergencies. These procedures include intubation (where a tube is entered into the windpipe to help a patient breathe) and needle chest decompressions (inserting a needle into the chest to release the build up of air pressure). We carry a full range of equipment on our emergency ambulances, including electrocardiogram (ECG) machines to monitor a patient’s heart and defibrillators which can restart the heart if a patient goes in to cardiac arrest. 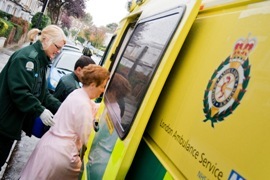 Our A&E support crews also go to patients in an ambulance. But they deal with patients who do not need the clinical skills of a paramedic or emergency medical technician, nor an ambulance on flashing blue lights. The staff who form these crews have been trained in basic life-support and help to keep our emergency ambulances free to attend patients who are seriously hurt or unwell. They deal with a variety of patients, including elderly people who have fallen at home, transfers to hospices and children with high temperatures.